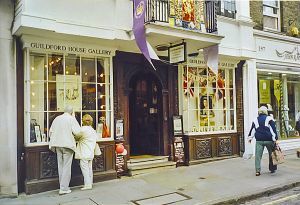 Guildford House Gallery is a 17th-century townhouse at the top of Guildford High Street, housing displays of local history, architecture, arts and crafts. The house boasts beautiful plasterwork ceilings and a 17th-century carved staircase. Guildford House was built in 1660 for the Childe family and retains many of its original 17th-century features, including finely crafted plasterwork ceilings, wrought-iron window fittings, wooden panelling, and a beautifully carved staircase. John Childe was a successful London solicitor, the son of a Buckinghamshire gentleman. He moved to Guildford around 1656 with his wife Olive, and in 1659 he purchased the property on High Street between a pair of inns. The following year he began building Guildford House. The Childe family seems to have gone from strength to strength, for John Childe served as mayor of Guildford 3 times. His second son Leonard inherited the house. Like his father, Leonard was involved in town politics and served as Town Clerk for 25 years. In 1736 the Martyr family purchased the house and retained ownership until the 1840s. The house is fascinating; built on a timber frame, with huge brick chimneys and a cantilevered upper floor projecting out over the street. It seems likely that the timbers used in the building are much older than the house itself, and were brought here from an older building. 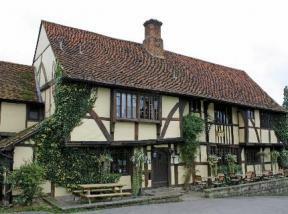 The exterior features carved oak framing added onto the timber beams, in a style reminiscent of Inigo Jones. The interior is full of period features. The most interesting room is the Powell Room, built to a classic 'half-cube' proportion (20 x 20 feet square and 10 feet high). The walls are decorated with early 18th century moulded panelling and the ceiling has beautiful 17th-century plasterwork details. Another interesting room on the first floor is the Pine Room, named for its finely crafted pine panelling. The chamber, which probably served as the master bedroom, still has its original 17th-century mantlepiece, carved with fruits and flowers. Throughout the house are pieces of historic furniture, including a 1640 oak sideboard, an early 17th century Court Cupboard, and a late 17th-century long case clock. Perhaps the most eye-catching features is the staircase, which rises straight up through the centre of the house from ground floor to the top floor. The staircase is made of oak and elm, with beautifully carved newels and pierced panels depicting acanthus leaves. Unusually, the top floor panel is most elaborate. This is odd, for the top floor was used only by servants, and you'd expect this to be the least decorated part of the stair, This suggests that the staircase may have been brought in from elsewhere and simply pieced together at Guildford House. The historic house serves as a display area for the Guildford borough art collection. Included in the collection are paintings by John Russell, RA (1745–1806), a native of Guildford. There are examples of costumes and textiles, decorative artwork, and local heritage archival documents. The gallery is part of a group of historic venues around the town known as Guildford Heritage. The group also includes the castle, guildhall, and museum. The gallery is free to enter and offers regular arts and crafts exhibitions, workshops, and lectures.